Some eclectic names even for an IWRG card. Utamaro is a Japanese wrestler who’s been seen a bit in the US in the last couple of years and appears to be hanging out with Hijo del Pantera. This past weekend’s CMLL story was about how Rush & Bestia del Ring are more Ingobernables than Munoz. That gets pushed to the side tonight, as they’re back to teaming with Mistico against NGD, with Terrible split apart from them in the semifinal. I think that matchup means rudo Mistico and NGD as faces, and maybe it’ll go somewhere. Volador & Terrible in the semi-final is a potential Universal title final. Angel de Oro, SOerbao, Shocker and Vangellys fill out the match. Triton, Esfinge, and Fuego take on Polvora, Malayo, and Felino in the tercera. 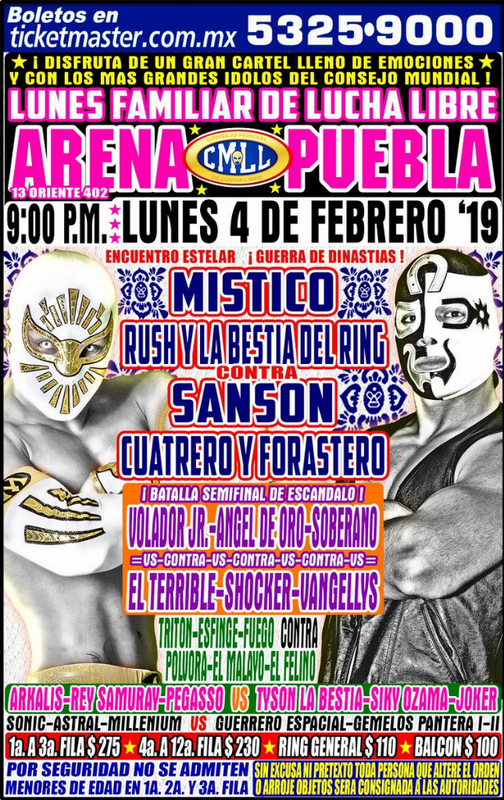 Siki Ozama is back for a second straight week, facing Joker & Tyson la Bestia taking Arkalis, Rey Samuray, and Pegasso. If there’s a direction for Ozama, it’ll probably be evident tonight. Sonic seems to be showing off more often in Puebla than Mexico City. He teams with Astral & Millenium versus Guerrero Espacial and the Gemelo Panteras. The show starts at 9 pm. The El Planchitas column says AAA will start on TV Azteca on the last week of February, but the reason there were not been many details in the announcement is those details haven’t been worked: they’re still deciding on when it airs and who announces it. Jesus Zuniga is apparently an option, as he doesn’t work directly for Televisa after all, but all the other announcers are out. El Planchitas also point out that Televisa is keeping the AAA film library. They would also have the CMLL film library but have done nothing with it. I’m unclear on what AAA owns and what Televisa does. AAA has been airing footage from as early as 2003 on their Twitch channel, as well as older footage during some TripleMania marathons, but their footage only includes in-arena footage and none of the vignettes. Tomorrow is the 35th Anniversary of El Santo’s death, a subject of the cover of this week’s Box Y Lucha. El Hijo del Santo will take his annual visit to the El Santo statue, which usually comes with a press conference. There are sometimes plans announced for the rest of the year. There wasn’t much of that last year, and El Hijo del Santo didn’t end up wrestling much. Atlantis Jr. is already in the main event. Eh. Difunto would be making his Guadalajara debut. He wrestled on the most Tuesday Guadalajara shows of any of the locals last year (one more than Star Black) and is the current Occidente middleweight champion. They’ve seemed high on him as Guadalajara local, but few of those have made their way to the main roster in recent years. These are the results for 2018 Tapatia Awards, honoring the best in lucha libre. Thanks to everyone who voted, and thanks for those who didn’t for still reading this. We had 89 ballots this year, up by about a third. Full results from past years: 2004, 2005, 2006, 2007, 2008, 2009, 2017. There’s a problem with this award. 8 different people voted for Barbaro Cavernario versus Fenix as their first place match without indicating which of the two matches they meant, and people did that down ballot as well. If all of those went towards the November match, that would’ve been the first place winner. If I split them among the two, it wouldn’t change the order. I’ve left it as a separate line. I’ve also left in some matches that I don’t really think count but don’t really affect the voting in a meaningful fashion.